The Collaborative for Educational Services has been providing leadership in Special Education since 1974, designing student programs and supports for learners with diverse and highly individualized needs. 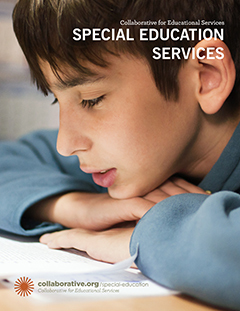 In partnership with schools and districts, we share expertise, best practices, and current research to support and guide educators toward the goal of helping students from ages 5-21 with disabilities to reach their full potential. Building capacity for schools and districts with a wide variety of supportive direct student programming, and in-district program consultation and technical assistance. Developing and providing professional development for teachers, specialists, paraprofessionals, and program leaders. Offering programs and instruction with high teacher-student ratios and the ability to be highly individualized, with responsiveness to the unique social-emotional needs of each child. Offering a team of highly qualified specialists and faculty to schools and students to provide services and expertise including speech, physical therapy, occupational therapy, sensory integration, vision-orientation and mobility, adapted physical education, and assistive technology. Focusing on creating programs and services that are research-based and seek to raise the bar for more effective and efficient educational programming for all students with all abilities.